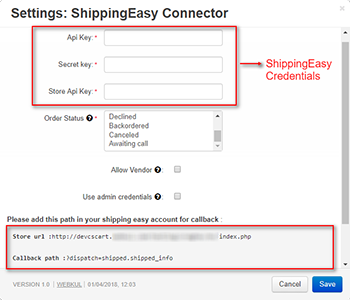 CS-Cart ShippingEasy Connector : Spending too much time and money in managing orders on various marketplaces along with your own CS-Cart store, then optimize & speed up the process with this CS-Cart ShippingEasy Connector. ShippingEasy is the cloud-based shipping platform with which online merchants of all sizes can ship fast. After its integration, It automatically fetches all order details into a single screen for easy & real-time shipping management. So, manage orders, automate shipping, track shipments via all in one easy-to-use, cloud-based shipping platform. Please note that demo link is not available due to unavailability of sandbox credentials. For detailed process flow of the add-on, please check the user guide manual. Did you buy CS-Cart ShippingEasy Connector?